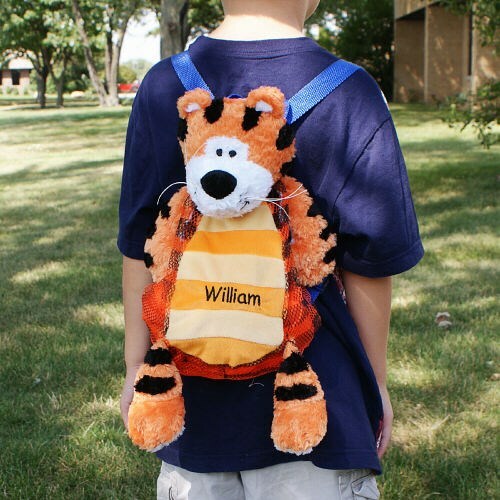 Make your child's day with a Tiger Silly Sac! Perfect for day trips to the zoo, park or store with mom and dad! This Embroidered Tiger Sac is great for bringing along toys, books and special treasures. This Plush Tiger Sack features a mesh body, back zipper opening and adjustable straps. Machine washable on gentle cycle and air dry. Measures approx. 18". Free personalization of any name is embroidered in black thread. Free Gift Wrapping and a Free Gift Card are included to create a thoughtful presentation. Additional Details Our Embroidered Silly Tiger Sac is an adorable gift for your girl or boy. Shop 800Bear.com for all your Plush Embroidered Gift Ideas.